Behold my new go-to breakfast; kefir chocolate oats. With just a handful of ingredients, this nourishing, gut-loving bowl comes together in minutes and will start your day with a little taste of heaven. Unlike most overnight oat recipes that are yogurt-based, this one calls for kefir, a fermented beverage with a consistency somewhere in between milk and yogurt, making it my top choice to blend into oats. Why should you try kefir? As a fermented food, it’s an efficient way to introduce healthy bacteria into the diet which helps to improve the diversity of microbes living in the gut. Other fermented foods you may be familiar with include yogurt, kombucha and sauerkraut. 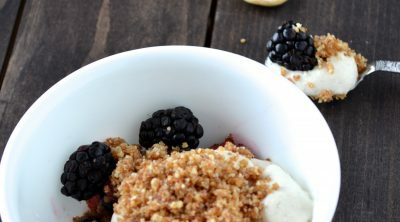 But with this deliciously simple breakfast recipe, I have a gut feeling kefir will become a regular on your menu too. In a small bowl, place the oats, kefir, almond milk and raw cacao. Stir until combined. Sprinkle with cinnamon, coconut and maple syrup. Top with fresh fruit and enjoy. To make this recipe ahead of time, combine the ingredients in an airtight jar and keep in the refrigerator up to 3 days. Add additional milk to loosen as needed.